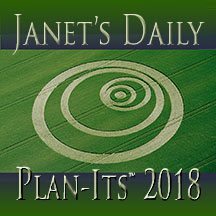 The “classic” style of Janet’s Plan-its is back and ready to ship, with lots of extras beyond the weekly highlights and daily information. Bonus: thirteen-month calendar covers 12/19/2016 to 1/14/2018. Seize the right day! 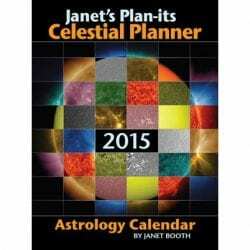 Astrologer Janet Booth draws on 37+ years of experience to explain the planetary movement and influences, recommending favorable times for important plans in this unique astrology calendar/planner/diary/almanac, in its 17th year. 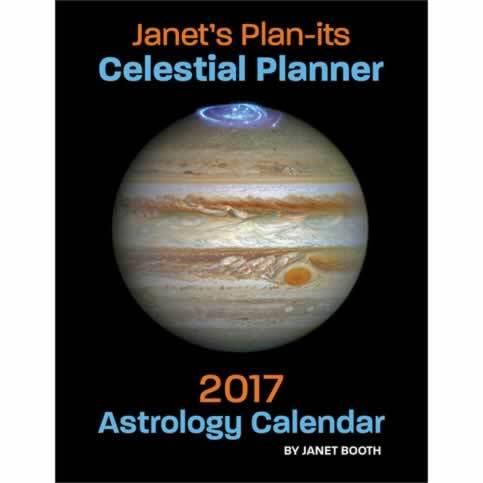 Like a cosmic weather report covering conditions affecting everyone regardless of one’s zodiac sign, Janet’s Plan-its appeals to novices, students and professionals. 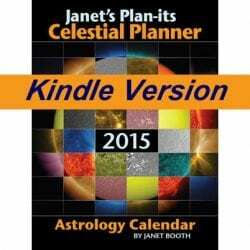 Readers use it to the depth of their astrological knowledge. Customers say, “ingenious,” “easy-to-use daily guide,” and “exactly what I want in an astrology calendar!” A list of the best and worst days for various activities is invaluable for scheduling. Each day is rated as to its ease or challenges with a message suggesting what energies may be encountered or utilized. Times (in Eastern and Pacific) when the Moon enters a new sign or begins a condition called Void of Course are noted. Weekly highlights give an overview of the current factors. Additional features: the next year On a Page (showing retrogrades and moon cycles); extensive footnotes interpreting planets’ entry into signs, shifts in apparent motion and interactions with other planets, New and Full Moons and Eclipses; resources and links for further exploration; ephemeris reprinted with permission from ACS Publications; Dietrech Pessin’s Moon Family table; and articles by guest contributors: health indications for the signs by medical astrologer Diane Cramer and moon phases (with recommended rituals) by astrologer and Wicca High Priestess Maria Kay Simms. BONUS: coupon for $25 savings on Janet’s services. Made in the USA. Suitable for North American time zones only.